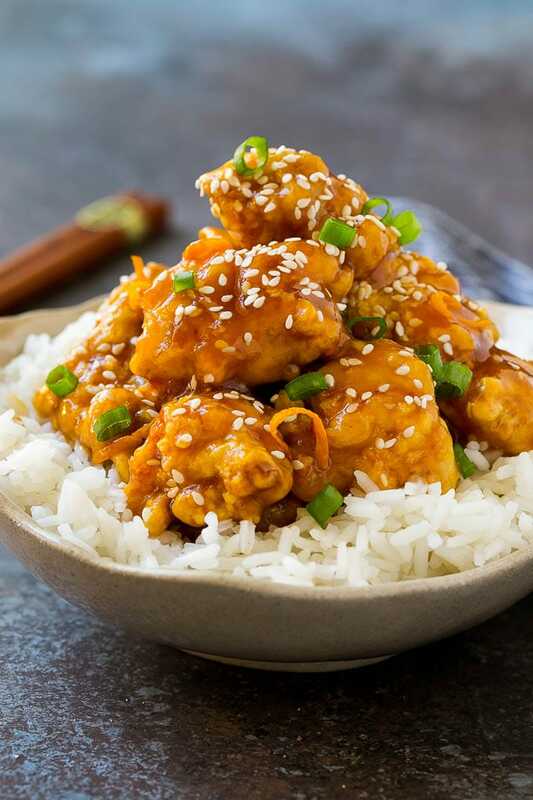 This orange chicken is a Panda Express copycat recipe with crispy chicken in a sweet and tangy orange sauce. My version tastes just as good as the restaurant version and is easy to make at home! Chinese orange chicken is totally irresistible – that SAUCE, it just makes the dish something special. This chicken has the same flavors as the Chinese food classic made in the comfort of your own kitchen. Serve your orange chicken with fried rice or chow mein for a complete meal. Some of my favorite dishes are the copycat dishes I get to play around with. This Panda Express orange chicken definitely makes it to the top of the list as one of my favorite meals to make. It’s a pretty easy dish and the kids always come back for seconds. 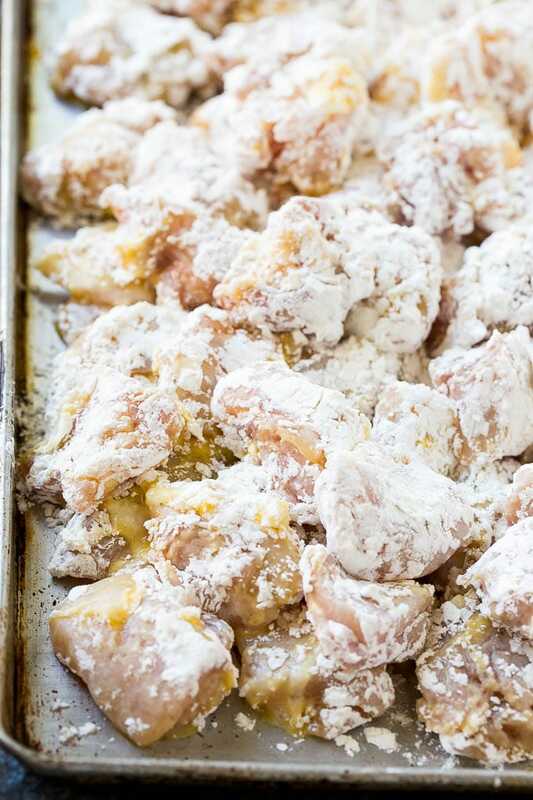 The first step to making orange chicken is to prepare your chicken for frying. 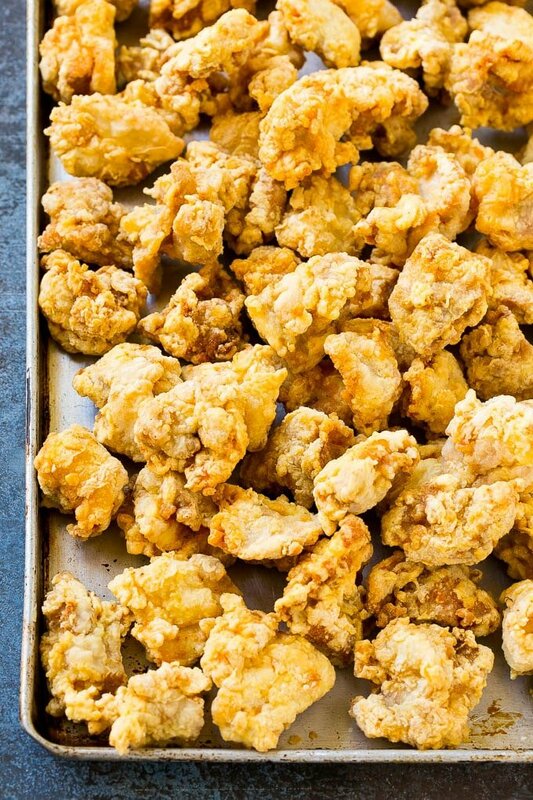 Chicken pieces are coated in eggs, flour and cornstarch and then deep fried to crispy perfection. The traditional recipe uses chicken thighs, but if you prefer chicken breast that is fine to use too. While the chicken is frying, I make the orange sauce which is a combination of orange juice, soy sauce, brown sugar and seasonings. How does Panda Express make their orange chicken? Classic Panda Express orange chicken doesn’t include the sesame seeds and green onion, but I add them for the color and flavor. These two ingredients are definitely optional and don’t define the dish. So, if you want an exact Panda Express replica, omit these two ingredients. This chicken is best served over a bed of steamed rice. I suggest serving the chicken right away as the breading starts to soften when sitting in the sauce. You can also serve your chicken over noodles or on a bed of steamed broccoli. CAN ORANGE CHICKEN BE MADE IN A SLOW COOKER? This dish can absolutely be made in a slow cooker. Of course, there’s a difference in the way it’s prepared. I actually love making orange chicken in the crockpot and show you how to do so HERE! Orange chicken is not the healthiest dinner choice because it’s fried and the sauce contains sugar. 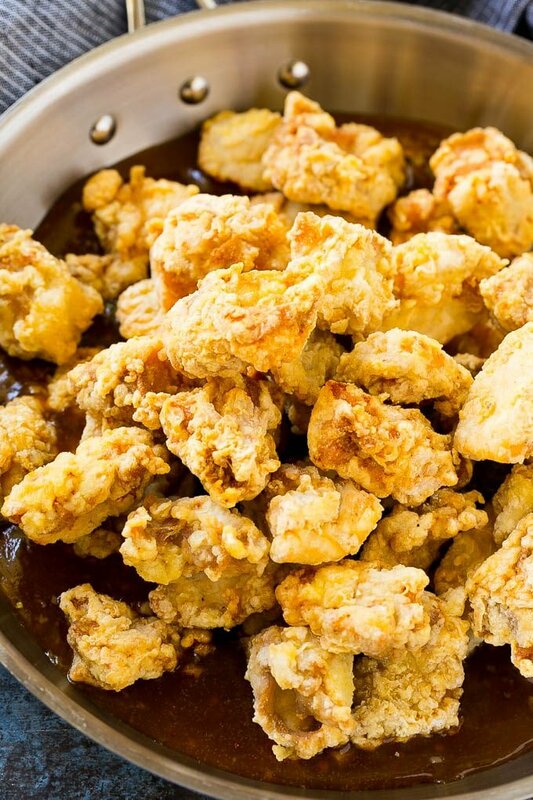 If you’re looking for a healthier version, you could try stir frying your chicken in a small amount of oil instead of breading and deep frying it, and cut the sugar in the recipe down by half or use low calorie sweetener. Whether you prefer this chicken in the slow cooker or oven, either way, it turns out to be one of my favorite dishes every time. It has such a bold, sweet flavor that it’s hard to put the fork down! My kids are always begging for this dish and I’m always happy to serve it! Place the eggs in a bowl; add salt and pepper to taste. Mix together the flour and cornstarch and place in a shallow bowl or on a plate. Dip each piece of chicken into the egg mixture, then coat in the flour mixture. Repeat the process for all of the chicken pieces. Fry 8-9 pieces of chicken at a time for 5 minutes or until browned. Repeat with all the remaining chicken. Heat the 2 teaspoons of vegetable oil in a saucepan over medium heat. Add the garlic and ginger and cook for 1 minute. Add the orange juice, soy sauce, brown sugar, orange zest, crushed red pepper, rice vinegar and sesame oil to the pan. Bring to a simmer. Whisk together the cornstarch and water. Add to the pan and cook for 2-3 minutes, stirring constantly, or until sauce has thickened. Add the chicken pieces to the pan and toss to coat with the sauce. Sprinkle with sesame seeds and green onions and serve. Garnish with additional orange zest if desired. 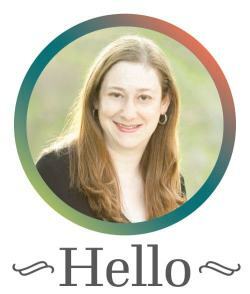 Thank you – This recipe was great! My kids love Orange chicken, but it’s hard and messy for me. This recipe was a little easier than others I’ve tried (or maybe my skill is improving), and tasted really good! Love your site and especially your Asian dishes. My teen son gives this a 4.5 star rating. Not a five, because of the messiness in the process of making the dish. We are trying all new dishes from this website for an entire week. So far we are three out of three hits! =) Thank you. Everyone in my family loves chicken and I’m always looking for new ways to prepare it! Thanks for this recipe! Orange chicken?! Wow. That sounds so unique. It really looks so yummy, and this is perfect recipe that I’ve ever seen. 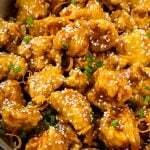 I agree chinese orange chicken is totally irresistible and I need to try this recipe. Thank you for sharing. Oh wiw, this one is a winnner. It looks really good. It will be a huge hit for sure and will disappear at home in no time. I love orange chicken and other asian inspired flavors.. I need some now! This looks great!! 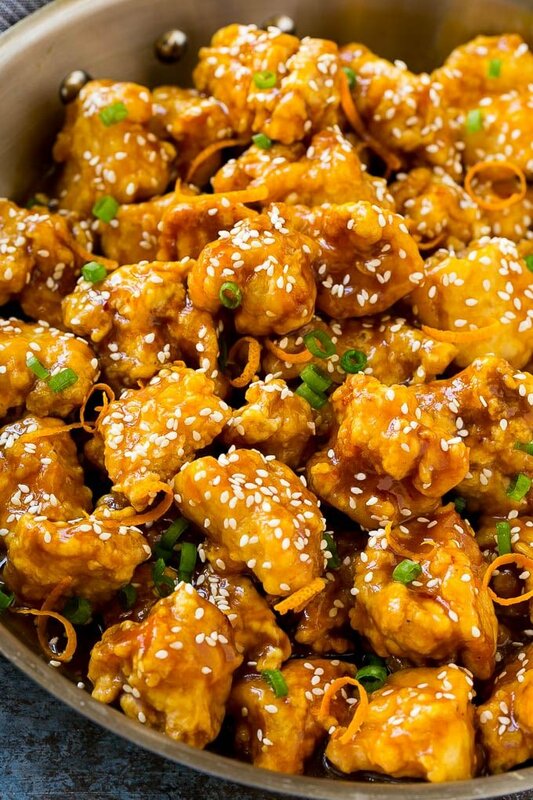 I’ve been craving orange chicken, and this recipe looks great. I will probably use chicken thighs because they’re my favorite. I am so glad to came across your post because I’m looking for this kind of recipe to try. That orange chicken looks really tasty and delicious! This sounds like a great combination of flavors! Thanks for sharing your recipe. This would be good to make when we have guests over since I am always trying to figure out what to serve when we are entertaining. 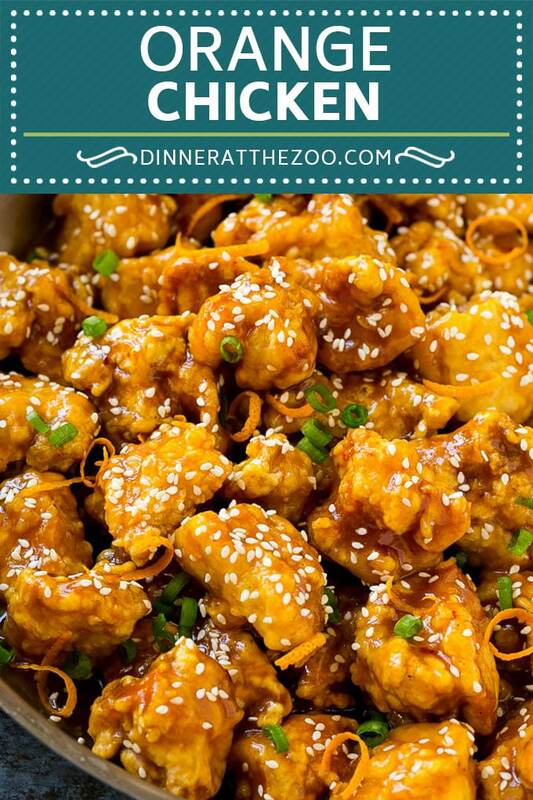 Chicken is always my best dish, I would love to try out this Orange chicken! I absolutely love orange chicken! This recipe looks delicious. Love that you included some FAQS as well! Wooo.. Another delicious orange recipe for chicken addicts.. Lol. Raised my hand! Love this dish, would really try this. Hmm yum! This orange chicken looks sooooo delicious! It is making me hungry! Five stars! I can’t wait to try; this recipe. Orange chicken is one of my favorite dishes ever.